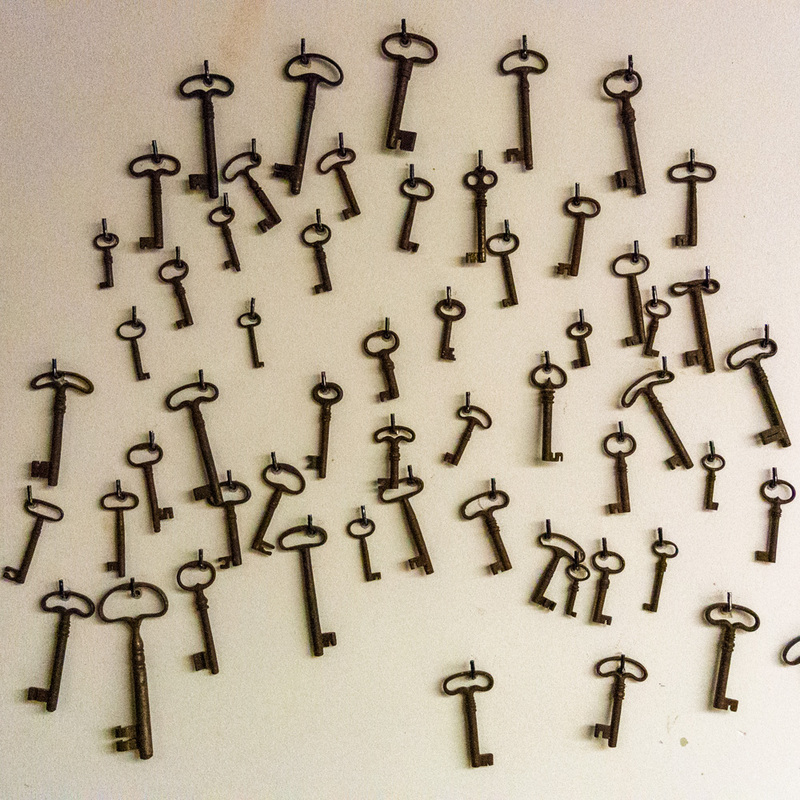 As a blogger, you sometimes have to take risks. Such as today when I run the risk of boring you. I know, I have been going on a bit over the last week or so about Easter celebrations in Mallorca and processions and other such traditions. And I know that I have reported in past years about the spectacular performance of the Davallament (Passion Play) in Felanitx, my hometown for the last 25 years. But, here I am again. 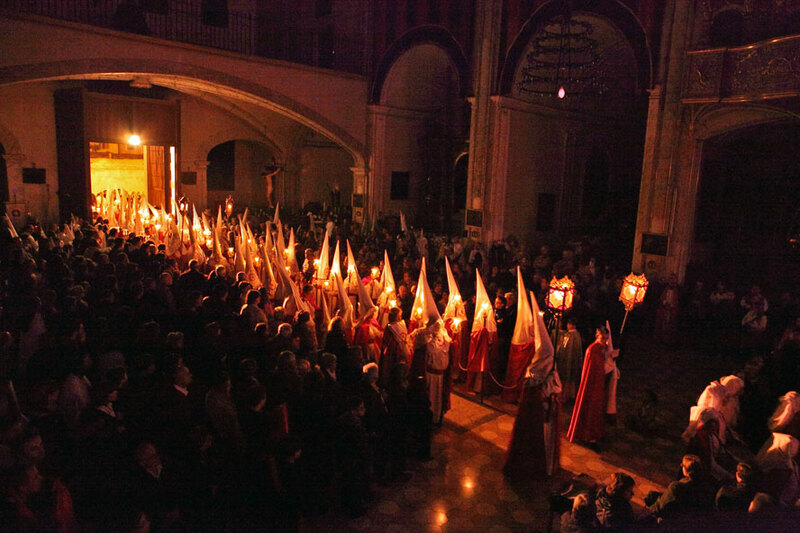 This year’s Davallament performance took place last night, as always on Divendres Sant (Good Friday). Luckily the rain was holding off. The show was organized by the Creuada de l’Amor Diví amateur group, as always for the last 37 years, and directed by José Luís Fernández. The Davallament is a synopsis of the suffering, the death and the crucifixion of Jesus. 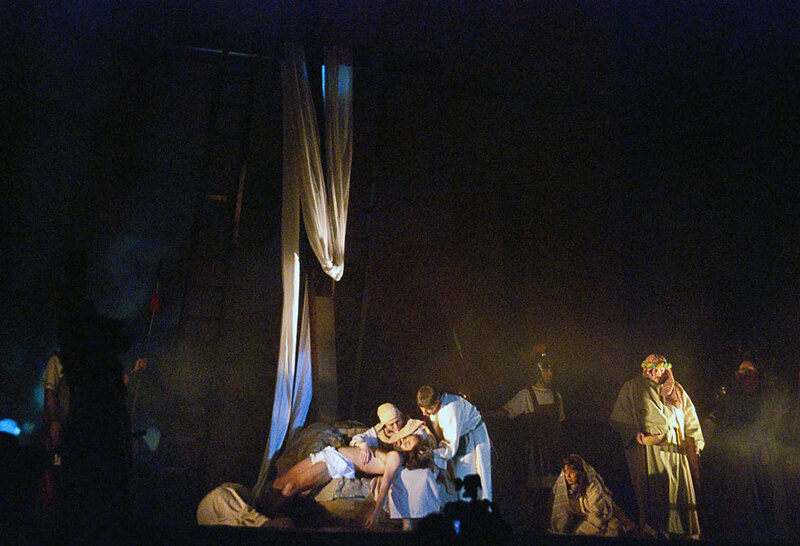 The play is made up of five acts (Last Supper, Ecce Homo, Encounter with Maria, The First Fall, and El Davallament [Taking off the Cross]). As every year, I am amazed how relatively little this show is attended. Yes, there were a few thousand locals around and one or the other tourist, but truly speaking, the performance should warrant recognition on a scale way beyond the borders of Mallorca, and certainly, beyond Felanitx. 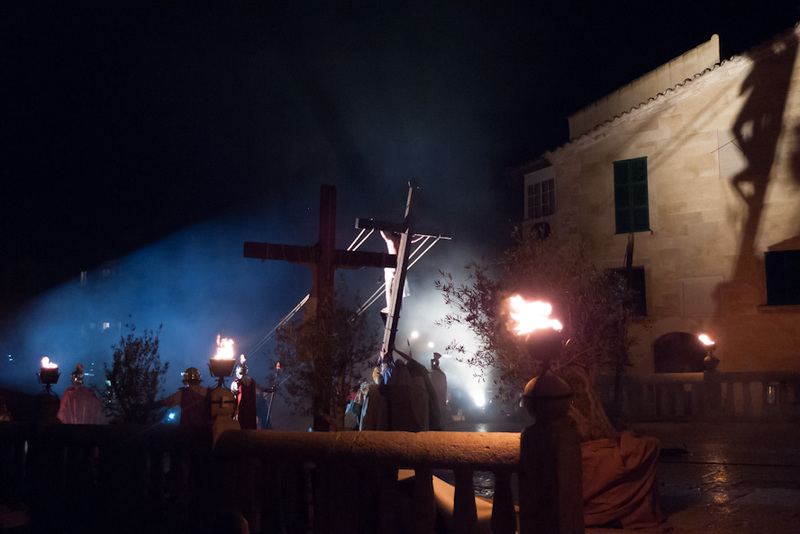 After the performance, a procession involving all of Felanitx’s fraternities took a statue representing Jesus Christ to the Església de Sant Agustí, where it was entombed in a ceremony called Enterrament (see photo bottom), awaiting resurrection. The Christ figure will be brought back from Sant Agustí to Sant Miquel tomorrow morning, Sunday, to be reunited with a Maria statue in a rather moving procession called L’Encontrada (The Encounter). The photo (top) was taken in Felanitx, Mallorca, Baleares, Spain. The date: April 6th, 2012. The time was 21:35:24. The photo (centre) was taken at the same place, the same night, by my friend Guenter Woehrle. The photo (bottom) was taken in Felanitx, Mallorca, Spain. The date: April 23rd, 2011. The time was 00:18:15. Credit goes to Manolo Serra Serra. Thanks for sharing so much information – we went to the procession in Alcudia – just fascinating to watch! In spite of cooler temperatures, there were quite a few people there. I would guess many tourists but also many locals. You are not boring me in the slightest. Ineed, your daily posts whet my appetite for returning to Mallorca for another holiday. Perhaps the next time it should coincide with la Semana Santa.